Businesses of all types and sizes contend with the temporary or permanent loss of paper documents, which can impact office productivity, customer satisfaction, even corporate image. That’s one of the reasons why so many businesses implement an electronic document management systems (DMS). These systems streamline conventional hardcopy documents into digital workflows. To further enhance the many benefits of a document management system, KYOCERA has developed DMConnect - a robust business application that transforms your MFP into an on-ramp for routing documents to any folder in your DMS, not to mention store, retrieve and share files quickly, easily, and securely. The scanned information is processed based on your customized workflows. 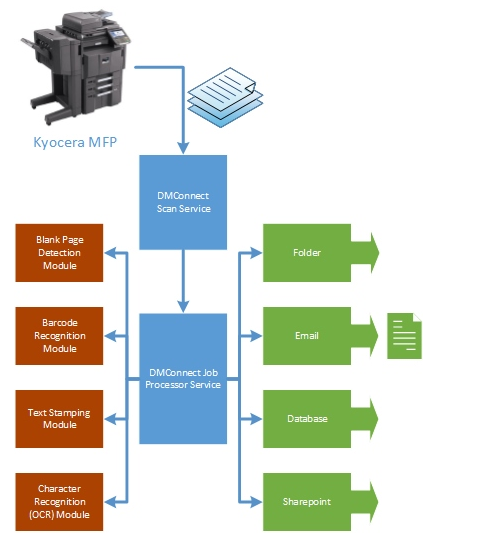 DMS Link, a Kyocera-developed business application, leverages a connected Kyocera or Copystar MFP to seamlessly link to your existing document management system. Users enjoy simple, familiar touch-screen operations, enabling fast entry of business-specific data (indexing) and scanning of hardcopy; the electronic file is automatically routed to a designated document repository. From a network computer, indexed files – purchase orders, invoices, contracts, and more – are easily searchable from a central database.